A terminal illness is a disease or condition that cannot be cured, and that will likely lead to the patient’s death. Some of the most common terminal illnesses can include cancer, AIDS, Alzheimer’s disease, and heart disease. Depending on a variety of factors, such as the type of condition and treatment, a person may live with a terminal illness for days, weeks, months, or even years. It’s important to speak with your doctor to make sure that you understand the diagnosis completely, as well as your options for care. After receiving a terminal diagnosis, a patient will probably begin to receive hospice care or palliative care to manage their symptoms and pain, as opposed to receiving treatment to cure their illness. 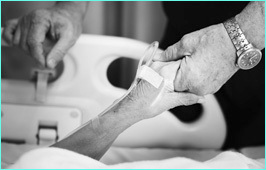 Once a patient receives a terminal diagnosis, it is a good idea to make healthcare decisions and prepare legal, financial, and emotional matters.The family and caregivers may decide that it is time for the patient to receive hospice care and prepare for the dying process comfortably. The patient should consider filling out paperwork for a will, healthcare proxy and advance directive. Finally, preparations for a memorial service, burial, or cremation should be made. Terminal illness may pose existential challenges, such as attaining a sense of peace and closure. If you have a bucket list or anything that you would like to accomplish at the end of your life, now is the time to set those priorities in order. You may wish to spend more time with your family and friends as you near the end of life. Having “ the conversation" with your loved ones may help everyone prepare for the inevitability of death and the celebration of life that will follow. While each person experiences the dying process in their own unique way, generally a patient will gradually become weaker and weaker, spending more time in bed and less time awake. Aside from physical decline, terminally ill patients can also suffer from emotional and mental hardships, such as depression and anxiety. In such cases, patients may benefit from therapy and/or medications. Those with a terminal illness may find comfort in attending support groups for people going through similar experiences. Seeking emotional support from friends or family can be beneficial, too. If you are helping a loved one cope with a terminal illness, let them know that you are willing to listen and be present with them. You may also want to encourage your loved one to talk about his or her life, reflect on their most cherished memories, so that they can be reminded that their life truly mattered.